Only three strips this week, as Greysuit and Stickleback conclude their respective stories. The former has double its usual page count (10) this week for the end of Book Three. John Blake exposes Prince’s mercenary team to the world on YouTube, a means that sits rather awkwardly amongst Greysuit’s 90s charm. The strip is cynical throughout – as mercs shoot pregnant mothers or initiate other soldiers – but Pat Mills save his most ferocious satire for the occasional flashbacks to Blake and Prince’s private school days. Mills’ distate for the upper-class froths in every frame. A bit more attitude like that wouldn’t go amiss in Stickleback, a strip also getting the double-feature length treatment this week. Everything is just so…casual. Even when England is being taken over by other-dimensional entities there remains time for cordial chats. Which is a harsh criticism. In truth, if the exact same conversation on surrender happened in another book, the results could be wonderfully contrary. But here, Stickleback’s unlikeable shadow casts itself throughout the tone. Perhaps his new incarnation, revealed in the story’s concluding frame, might better this in the next chapter. Although really just a light filler issue before Wagner’s eagerly antipitated, imminent Dark Justice run, this week’s Dredd is actually rather endearing. Played mostly for laughs, Dredd chases down a perp who has hijacked an eldster tour bus. Unfortunately for the perp, the OAPs are suicide-happy nutcases. The high-speed pursuit quickly becomes a farce, as sleeping, wheelchair-bound pensioners are used as ammunition and retired war veterans remember their close-combat training. 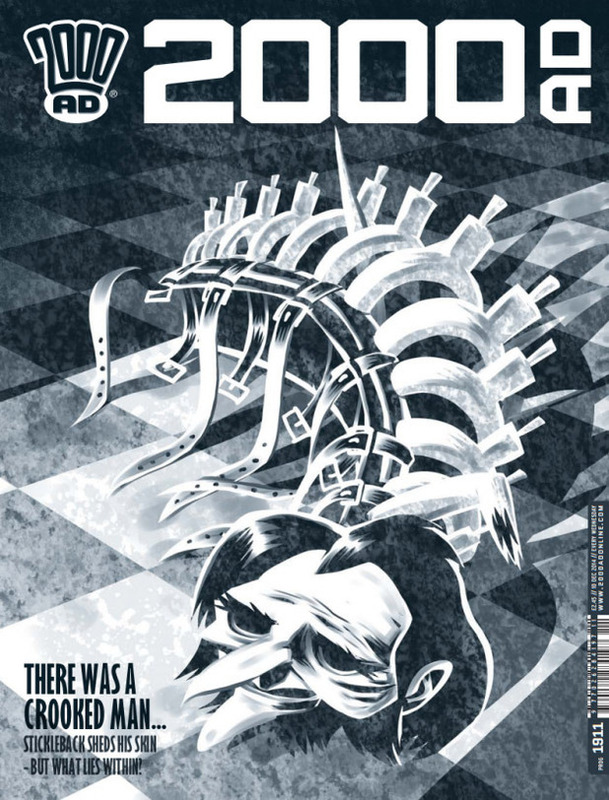 Sometimes, amongst the epic clockpunk worlds and grisly super-assasin stories, it’s nice to be reminded how funny and – more importantly – how uniquely British 2000AD is.